To support an organization's journey forward, adelante coaching + consulting offers a variety of high impact, custom designed, and engaging training programs for individual contributors, managers and leaders, and teams. Half-day, one and two-day sessions (introductory and advanced) are available on the topics listed below. Please inquire how we can custom design learning programs to meet your unique needs. 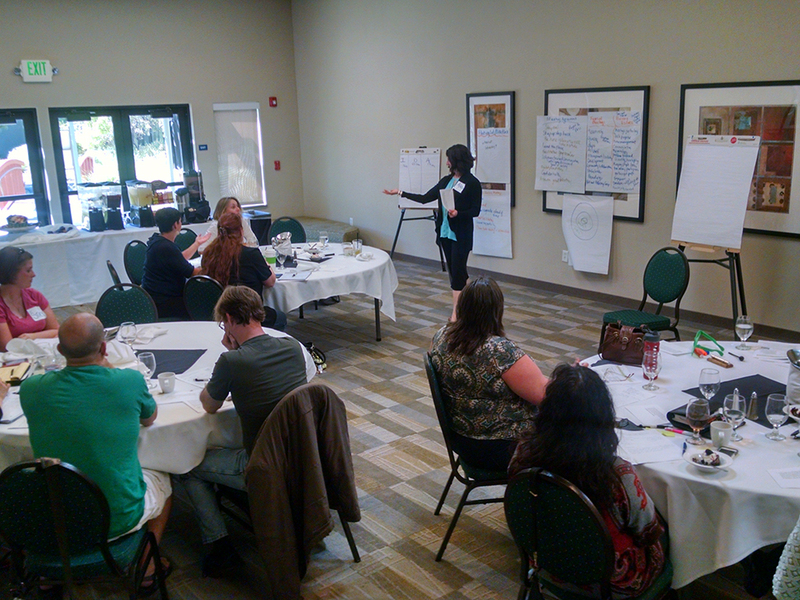 Trainings are designed and facilitated by adelante’s Founder and CEO, Alicia Santamaria. A training professional for more than 20 years, Alicia integrates her coaching skills with the best practices of adult learning theory in designing and facilitating training and team learning sessions that are engaging, experiential, interactive and impactful. To strengthen the impact and benefits of adelante’s trainings, post-training coaching is offered as a strategy to improve knowledge retention and application. Coaching offers participants a chance to hone specific skills learned in the training, put them into action, process the results of their practice, and get helpful feedback. Alicia also offers engaging and inspiring keynote presentations for conferences and events. She speaks on a variety of adelante’s focus areas related to both personal and professional development. Contact us for more information. Collaborative As self-directed beings, adults respond more positively to being asked and consulted about what they need rather than being told. Whenever possible, it suggested that some type of pre-training assessment be integrated into the planning so participants feel they have some input into the training content and design. Facilitative Participants usually come into a training with some knowledge on the subject and that wisdom should be brought into the room for everyone to learn from. Training should provide more than “pushing” information onto the participants, it should also include an element of “pulling from.” The role of the trainer is to also serve as a coach and facilitator. Experiential Participants learn best by doing and people learn in different ways. Participation also varies in a training based on learning styles and needs. Hands-on, interactive discussion and activities, and multi-media tools are used to enhance the learning experience. Lecture is used only sparingly. Trainings are structured to resonate with different learning styles by incorporating visual, auditory, kinesthetic and written components. Relevant Training content needs to have a direct and immediate application for the participants. For training participants to connect, stay engaged, and fully participate they must feel that their time is well spent and relevant to their experience. Training expectations and outcomes must be clearly identified and the training program designed to achieve those outcomes.